A few years ago, the USDA’s Paul Weimer ran a simple, but elegant trial that revealed how distinct one cow is from another. Using a kind of microbial community fingerprint- ing technique, Weimer discovered the rumen bacterial community composition (BCC) of individual cows can be determined. It was shown cows have individual and distinct microbial communities in their rumen. Researchers removed 95% of the rumen contents from two cows on the same diet and exchanged the contents with the other cow. The cows had different rumen pHs and volatile fatty acid (VFA) concentrations to begin with. Within 24 hours after the exchange, the rumen pH and VFA concentration returned to the original values for each cow. The BCC remained in chaos for 14 days in one cow and 61 days in the other, but returned to nearly the same as before the exchange. It’s amazing how the more we know, the more we find we don’t know about our cows. We feed cows by groups depending on production, stage of lactation or age, but now we know that even within those groups the animals are distinct right down to the bugs in their rumens. It is possible that we might be selecting cows based on their microbial communities in addition to their innate production potential. Derek Bickhart at USDA is carrying on this research. It appears from new research that, in fact, the microbial community of an animal is heritable. A newborn calf selects for a unique microbial community which, once established, can police itself. After that, it might “allow” other microbial species to establish certain niches, particularly during changes in diet or lactation. The microbial community also continues to change as the animal ages. Record-setting cows are typically mature, so they eat more and can devote more nutrients to production rather than growth. But incidental and unique microbial colonization as animals mature might also play a role in productive gains. The rumen transfer experiment left 5% of the rumen contents in each cow. So, the question remains, were these “seed” microbes that re-established the original microbial community or does the animal or “host” intensively select for its unique microbes? Either way, the fact remains the BCC is distinct and unique. Our knowledge of rumen microbiology has been based on few experiments and observations over the past seven decades. Once we establish an easy and accurate way to survey individual animals for their BCC, we might be able to get enough numbers to establish statistical correlations with productive parameters. This could be used as another predictive measure for our nutritional models. We know milk fat production is correlated with the ratio of the two bacterial phyla (Firmicutes and Bacteroidetes) in the rumen. It is also known that the ratio of archaea to bacteria is correlated with methane emissions. Selecting for lower methane might help alleviate environmental concerns about emissions from ruminants. Methane represents an energy loss for the cow, so the archaea:bacteria ratio might also help predict production. 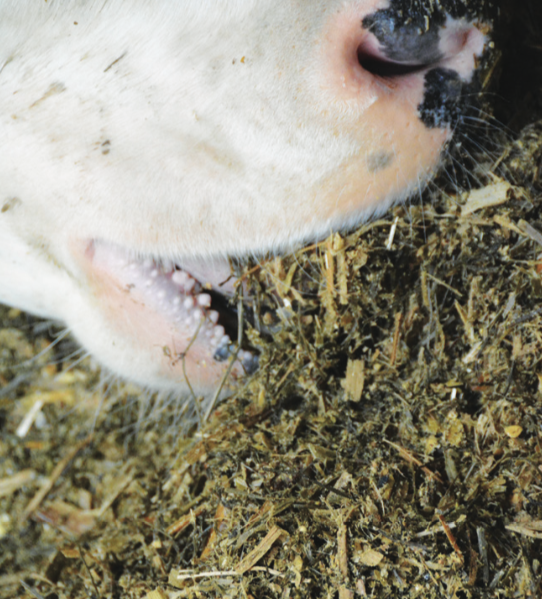 When a cow regurgitates rumen solids, it provides an opportunity to sample rumen contents. Weimer and Bickhart’s labs have been using mouth swabs to determine the BCC. This is a less expensive and invasive way to make comparisons between high and low producing cows, different rations, climate, breed and many other variables. Interesting findings, with implications to improve production efficiency.